Modern journalism is a tough business that's rapidly changing. The internet is still trying to make the distinction between a journalist and a blogger, so finding truly insightful, thought-provoking content can be difficult. The following are just a few of the journalists and organizations that we believe are helping to shape the future of journalism. Fellow Southerner Joshua Benton is the founder/director of the Nieman Journalism Lab and with his background in newspaper, he adds a traditional touch to blogging (which we appreciate). By their own account, “Nieman Lab is a project to try to help figure out where the news is headed in the Internet age”. Nieman Journalism Lab is attempting to redefine how journalism works. Nieman Lab is “fundamentally optimistic” about the future of journalism, and we think they’ve got the right idea. Our pick - Benson's piece on the lack of geographic diversity in American news. Jay Rosen wants to draw a line between “media” and “press”. Rosen encourages the journalists to take a more active interest in citizenship, improving public debate, and enhancing life, as evidenced through PressThink. We like Rosen for his critical approach to journalism and lack of fear when it comes to proding the industry. Our pick - Tone poem for the "leave it there" press. There's also an excellent interview podcast between Jay Rosen and Joshua Benton (mentioned above) that is worth a listen. While AEJMC isn't quite a standard blog publication, we still like to include it in our list for it's dedication to advancing education in journalism, research and promoting the "free flow of communication". With it's journals, publications, conferences and interest groups, AEJMC is sure to get you immersed in the world of academic journalism. Our pick - a recap of the most recent AEJMC conference in Minneapolis. GIF the debates and the fun never stops! The 2016 presidential election cycle has been as unpredictable as any election in recent memory with over 20 sanctioned debates, numerous “town hall” discussions and countless candidate speeches. News organizations have been overwhelmed with an unprecedented volume of visual content to share with their viewers. While debates have been broadcast on television since 1960 (the famous Kennedy-Nixon debates), there has been a seismic shift in the way the presidential debates have been covered in the media this election cycle. The New York Times said it best: political GIFs have become the new sound bites of the 2016 campaign season. 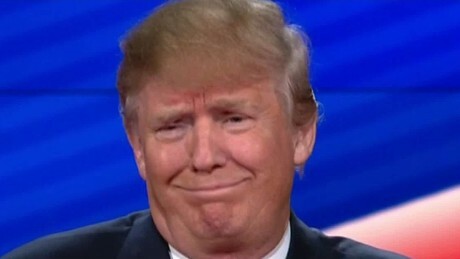 Animated GIFs have been synonymous with coverage of the 2016 presidential race. Whether it is Donald Trump making exasperated faces at his opponents or Hillary Clinton seemingly wiping dirt “off her shoulder,” these instantly shareable bite-sized moments have helped amplify and focus attention on the strengths and weaknesses of the candidates running. SnapStream makes it simple for organizations to take a moment from television, create an animated GIF and post it to their social media accounts in just seconds. Live-tweeting of this election cycle has made it easier than ever to follow along with candidate events in near-real time. It also allows the organizations sharing the content to frame the conversation in the language of the social network on which it is being shared. Savvy media and political organizations have jumped on the GIF bandwagon and are sharing moments from the debates and other election events, creating incredibly engaging and viral content while informing their readers about the candidates and issues. If a picture is worth 1,000 words, an animated GIF could fill a volume! 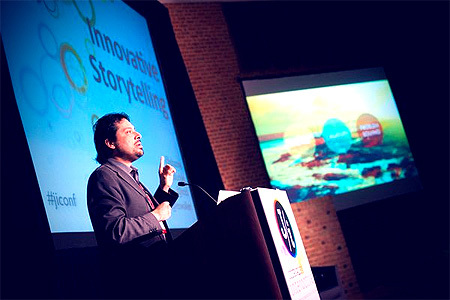 Tomorrow SnapStream will be participating at Journalism Interactive 2013, a new conference focused on intertwining journalism education and digital media. Host of the second annual event, the University of Florida houses one of the top 10 journalism schools in the country. 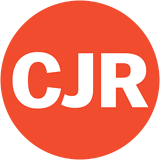 Scholars, practitioners, teachers and students, from universities near and far, will congregate at Journalism Interactive to share their successful approaches for delivering journalism education in today's metamorphic media space. I graduated from UF's journalism school, so I'm filled with excitement about SnapStream's involvement with Journalism Interactive, which serves a tremendous purpose. It's admirable that this group of universities is taking an active role in seeking out new, influential technology and trends, and incorporating them into their curriculums. With computer-based access to live and recorded television, professors can implement new teaching and research methods. Like at Emerson College, Graduate Journalism Professor Paul Niwa teaches students how to compare and contrast the coverage of a single news event across various outlets and networks. By downloading transcripts and using the TV search feature, graduate students can count keywords and perform advanced content analysis. Over time, universities will develop a searchable TV archive or library, which then becomes a valuable research tool and media resource. Are you going to be in Gainesville for Journalism Interactive? Let us know! Folks, a tremendous peer-to-peer learning opportunity is on the horizon. Joining us from Emerson College in the heart of Boston, Journalism Professor Paul Niwa hosts an exclusive webinar with SnapStream on Wednesday, January 26. Professor Niwa, a longtime SnapStream user and pro, will share his best insights on the academic use of television search technology. Niwa teaches graduate-level journalism courses at Emerson, where he relies on SnapStream to find interesting TV content and create clips for lectures. Emerson students also have full lab access to SnapStream to conduct their own content analysis and broadcast research. • How does TV search work? • Why is it especially useful for studying broadcast journalism? • How did Emerson College analyze TV content in the past? • What are the best practices and research methods? You'll glean the answers to all of these curious questions. And you'll come to understand how core teaching styles have changed as a result of embracing digital recording and TV search appliances. Paul Niwa has a successful career as a TV producer on top of his nine years of teaching journalism at Emerson College. He launched two international television networks, six newscasts, and a streaming media newscast for NBC, CNBC, and StockHouse Media, Canada's largest internet company. He also helped NBC create "Early Today" and the award-winning "NBC Asia Evening News" in Hong Kong. Keeping our good word and following up from this previous post, we're giving you the replay of our J-School webinar featuring Content Supervisor Paul Hitlin at the Project for Excellence in Journalism. Paul Hitlin joined us on 5/26 before a virtual group of university educators, all eager to learn about fresh methods of conducting research, as well as sources for funneling data-rich content into their institutions of higher learning. Catch a glimpse into PEJ below. The clip illustrates how they've incorporated SnapStream into their quantitative research process, which is quite systematic. Visit our YouTube channel to view the remaining chapters of the webinar, including further insight from Paul on how they used to do things pre-SnapStream. "NON partisan, NON ideological & NON political"
1. Searching TV is a snap! Publishing widely regarded content analysis, the Project for Excellence in Journalism serves an important role: keeping the industry in check. A non-profit, non-partisan organization under the umbrella of Pew's Research Center, PEJ is a vital resource for journalists and citizens dedicated to the study and reflection of the press. 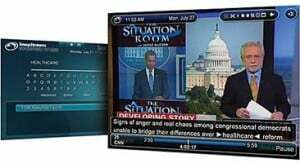 With teams of analysts watching and dissecting broadcast news on a daily basis, the Project makes great use of the SnapStream Server to capture traditional television and stream recordings right from their desktops, all in the name of empirical research. Speaking to the Project's Content Supervisor, Paul Hitlin, I gathered that this type of technology has made their workflow become much smoother; they were able to eliminate the hassle of burning DVDs and bringing them to their work stations, not to mention keeping them organized! What they find useful about going digital: they can directly play back content and archive it. This makes it easy to handle simultaneous things--like side-by-side comparisons of news outlets and writing up research findings--all in one place, from the PC. 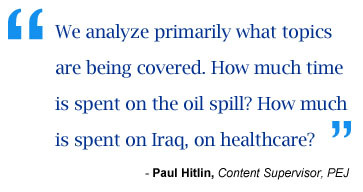 Paul Hitlin has graciously agreed to share his insights from the front lines, covering the bases of broadcast news analysis. On the horizon, he sees vast potential for the PEJ to expand the scope of quantitative trends they can isolate in the media from the source of TV search technology. For professors and professionals in journalism and communications, there's so much you can learn from Paul and what PEJ is doing. I hope you'll join us next Wednesday, May 26 for a live webinar and interactive question and answer session. Alexandra Fenwick at the Columbia Journalism Review interviewed me on a recent trip to New York City. That interview resulted in this piece about SnapStream and how folks are using it in academia and in entertainment. Check it out! The Sinclair Library at the University of Hawaii at Manoa maintains the only extensive archive of television broadcasts about Hawaii in the state. The library, which for decades relied on videotapes and VCRs, recently switched to a SnapStream Server to ensure the integrity and longevity of its media collection. In the past, student workers at the library selected broadcasts from published TV listings — and did the taping, quality, and pre-cataloging checks manually, which required hours of work and thousands of videotapes. “We can’t buy Super VHS tape quality anymore. The VCR is obsolete,” explains RuthMarie Quirk, manager of operations at Sinclair Library, who sought a digital solution. “The entire process of setting up recordings and processing recorded shows is much easier and faster with SnapStream,” says Emily Albarillo, the digital media specialist. On Tuesday, July 14th, join us for our web seminar geared towards K-12 schools looking to stream television to the classroom. 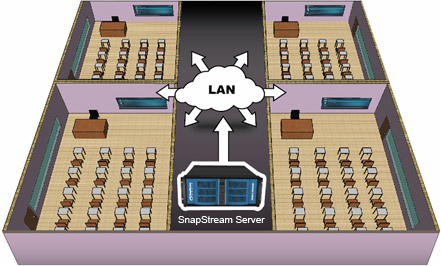 The SnapStream Server is a DVR appliance that allows schools to distribute television using their existing LAN, projectors and electronic whiteboards, eliminating the need for expensive RF cable drops, traditional TVs, VCRs and DVRs. In addition, the SnapStream server gives you the flexibility to record anything on TV, from PBS to Discovery to the History Channel to CNN. And unlike Safari Montage or Discovery Streaming, the SnapStream Server does not come with any expensive subscription fees. Using educational TV programs in the classroom, teachers can reinforce and expand on material being taught and increase student interest in learning. SnapStream makes TV useful to educators in entirely new ways — using SnapStream’s easy-to-use TV search technology, teachers can pinpoint relevant TV content themselves and then easily create clips and download for use in their class curriculum. Attend our web seminar to learn more about providing your teachers with a valuable new teaching tool - the SnapStream TV Server. Searching television for "breaking news"
Sometimes, we hear about cool and unexpected ways that our customers are using our TV search technology. This one example. Newsrooms are a big factor in the economic success of local television. They contributed 42% to a station’s total revenue, according to local news directors. And the majority of these news directors say their newsrooms are profitable. So competitive intelligence for a local TV station is important -- this means knowing who's getting the scoop on local news stories and how other local TV stations are covering the local news. And that's why one of our local TV station customers started using their SnapStream Server to scan for the words "breaking news" filtered on the names of their local news competitors. This particular local TV station setup multiple SnapStream E-mail TV Alerts on the exact phrase "breaking news" for each of their local market competitors. And by setting the frequency to "as it happens", the news director of this TV station now gets an e-mail alert everytime a competitive local station is reporting on "breaking news"! >>> Breaking news tops the news, right now firefighters are battling a two-alarm warehouse fire. Authorities are not sure exactly what is burning at the elwood warehouse but they are evacuating that building. We have on the telephone assistant fire chief from the houston fire department omar longoria. We thought this was pretty cool, so we've setup e-mail TV alerts on "breaking news" on a couple of the SnapStream Servers we are running here in our office. The sentencing hearing will be carried live here on "sportscenter" at noon eastern. Roger cossack will return to discuss that. We appreciate the insights this morning. >> My pleasure.breaking news out of the nfl and it is about the new england patriots who have signed another player. You may have heard of him before, linebacker junior seau entering his 19th season. He's returning to the patriots once again. He played for them in 2006 and in 2007, a 12-time pro bowler. I have a contrac through 2011. So right now that's what I have. Until somebody wris me another one. Ok? >> We need you. >> No, you don't. >> Oprah was in new york last night honoring susan taylor. Breaking news. She reveals there's big time confusion about who's throwing the party of all parties at obama's inauguration next mom. >> Everybody is calling me about having a party. The next news break is about an hour away, "hannity and colmes" continues right now. breaking news tonight in the minnesota senate recount. While most of the votes are recounted norm coleman is sill in the lead. Yesterday 171 ballots turned up giving franken an extra 37 votes, and with thousands of challenged ballots, his 316 lead could easily change. According to the republican party of minnesota franken is calling for an investigation into a minneapolis church and could possibly be connected to more than a hundred missing votes. Searching on the term "breaking news" is one useful way to put your finger on the pulse of television!